University of California, Berkeley, 1991, Ph.D.
University of Texas, Austin, 1986, B.Sc. Purity and purification costs are becoming important issues in biotechnology as the industry matures and competitive products reach the marketplace. 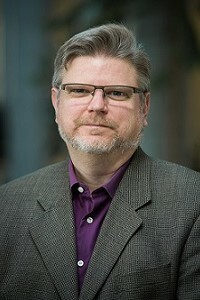 Research in my laboratory is focused on better understanding how biological macromolecules such as proteins and DNA interact with natural and unnatural ligands, and then developing new natural- and recombinant-protein purification processes based on high-affinity interactions between target proteins or drugs and separation media. My laboratory runs the Centre for Biological Calorimetry, a federally funded centre which provides Canada with state-of-the-art methods for measuring the delicate energetics of biological interactions in solution or at interfaces. We have also been involved in the development of Raman spectroscopy, particularly fibre-optic probes and related instrumentation which allow remote acquisition of high-sensitivity UV-resonance Raman spectroscopy data for biological samples, including tissues, biological interfaces, and complex solutions. In collaboration with Merck Chemicals (Germany), we have recently developed high resolution resins which utilize a layer of end-grafted polymeric chains to separate proteins on the basis of size and associated excluded-volume interactions. Our entropic-interaction chromatography columns, which are now commercially available, show dramatic separation performance for protein molecular weights ranging from a few kDa up to 1000 kDa. When engineered properly, molecular genetics techniques provide a robust method for purifying recombinant proteins from the complex aqueous solutions in which they are produced. Our lab, in collaboration with Drs. Kilburn and Warren of the Microbiology department, is also interested in purification strategies which use the cellulose binding domains (CBD’s) of Cellulomonas fimi cellulases as affinity tags. Genetic or chemical linkage of a CBD to the target protein creates a fusion protein which binds strongly to cellulose and retains the biological activity of the fusion partner. Recovery of the target protein is then achieved through either a modest change in system variables or enzymatic cleavage of the polypeptide backbone at the protein/CBD linkage. Synthesis of pharmaceutical drugs often requires precursors of specified chirality. However, chemical syntheses of drug precursors, such as amino acids, typically yield racemic mixtures. We are involved in the development of large-scale, continuous processes for separating mixtures of chiral enantiomers. Research to date has involved the fabrication and characterization of ligands which discriminate between chiral enantiomers of therapeutic or industrial importance, and the development of systems for continuous separation of chiral enantiomers. Research in my laboratories involves collaborations with industry, engineers, pathologists, chemists, and microbiologists. This collaborative research environment mirrors the multidisciplinary nature of industrial biotechnology and provides a sound foundation for understanding the complex structures and functions of proteins and thus, promising pathways for their purification.